Cheese is everybody’s favorite and fritters as well. When both are combined the taste goes up like anything. And when we add sesame seeds, it brings that crispness to the soft cheese. And further when we remove oil from these fritters, then what else we can say….health goes up and taste remains. 1. For marinate - In a bowl add all ingredients except Paneer . Mix well. Coat all cheese pcs with this mixture. Keep it in refrigerator for half hour. 2. Once cooled, take tilla or sticks and put through the paneer or cheese pcs longitudinally. 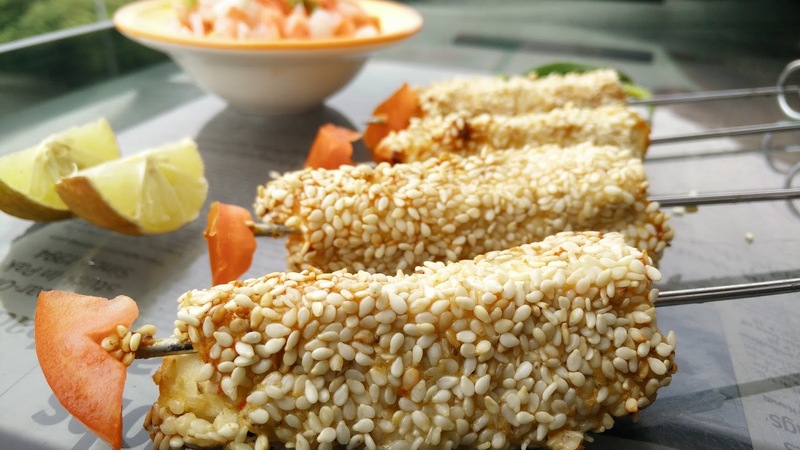 Place the sticks in sesame seeds to ensure that all sides of the cheese are properly coated with sesame seeds. 3. Keep these in preheated air fryer at 180 degrees for 5 min. Once done serve hot with chopped salad or sauce.